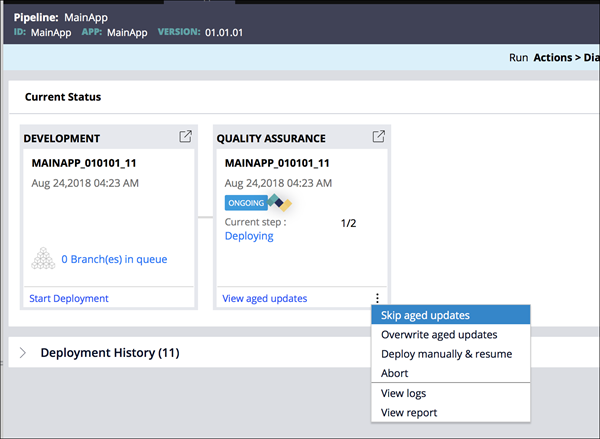 Beginning in Deployment Manager 4.x, can now manage aged application updates. An aged update is a rule or data instance in an application package that is older than an instance that is on a system to which you want to deploy the application package. By being able to import aged updates, skip the import, or manually deploy the application package on a system, you now have more flexibility in determining the rules that you want in your application and how you want to deploy them. For example, you could update a Dynamic System Setting on the quality assurance system, which has an application package that contains the older instance of the Dynamic System Setting. Before Deployment Manager deploys the package, the system detects that there is a newer version of the Dynamic System Setting on the system than in the package and creates a manual step in the pipeline. From this step, you can select if you want to import the aged update that is in the package into the system to override the newer Dynamic System Setting instance or if you want to skip the import. You can also choose to skip the manual step and then use the Import Wizard to manually deploy the package.